With an initial run totalling just five performances, Ezio was as close to a flop as operatic hit-maker Handel ever produced. Following its less than warm reception the opera languished unperformed in the archives until a 1977 staging at Covent Garden, but has never really gained popular traction. While it's no Alcina or Orlando, dramatically – and especially musically – Ezio is comfortably up there with Rinaldo, Agrippina and Serse in the second tier of Handelian operas, and it's a rather unaccountable shame that the whimsy of eighteenth century taste should have exiled it so thoroughly from the repertoire. Winton Dean ascribes the work's poor reception to tensions caused by the conjunction of Metastasio's 'classical' libretto and Handel's 'romantic' score, and this may have been the case – Ezio proved to be the composer's last setting of Metastasio's work. The plot itself is the standard Handelian contortion act, if rendered in an unusually sober vein. Set in Ancient Rome, it follows the fortunes of Aetius (Ezio), a general returning victorious from his defeat of Attila the Hun to serve Emperor Valentinian. The two men subsequently find themselves in a love triangle with Fulvia, daughter of Maximus – a schemer who is in turn plotting a coup against the Emperor. Loyalties and honour are subsequently tested as we discover whether truth is ever truly enough, whether in love or politics. Ever since their Admeto back in 1977 – the first contemporary performance of any Handel opera on exclusively period instruments – Alan Curtis and Il Complesso Barocco have been such exuberant and stylish champions of the Handel revival that it seem churlish to criticise their efforts; yet the zest which characterised previous recordings such as Admeto and Fernando seems to have dried up a little in their latest releases. 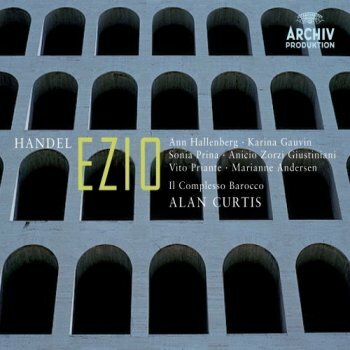 Both their new Alcina and this recording of Ezio share a slightly bloodless orchestral tone, with what was previously lightness of touch threatening to become a rather brittle instrumental sound. Tempi are slow – exceedingly slow in some cases – and the rather staid Overture and opening March sections set a pace that is maintained throughout. The only other recording of Ezio that exists was produced in 1995 by, rather unexpectedly, the Manhattan Chamber Orchestra under Richard Auldon Clark. It's a recording whose lush strings sounds and sustained phrases are as inauthentic as its 440 pitch, yet there is an energy and swagger to proceedings that Curtis and his orchestra somehow lack. Throughout the politely efficient Overture I found myself wondering what Le Concert d'Astree or Les Arts Florissants would make of the work, an imagined comparison that did not function in Curtis' favour. With previous recordings fielding reliably good, and frequently spectacular, vocal line-ups, it is no surprise to find regulars Ann Hallenberg, Sonia Prina and Karina Gauvin back (as Ezio, Valentinian and Fulvia respectively). Hallenberg and Gauvin split the vocal honours fairly evenly, with Gauvin's beautifully flexible soprano dispatching with equal conviction the dramatic 'mad scene' aria 'Ah, non son io che parlo' and the delicate coloratura of 'La Mia Constanza' (despite a decidedly sedate jogging tempo). This latter aria is one of several in the opera that would stand-up alongside Handel's finest, Ezio's gloriously plaintive opening 'Pensa a serbarmi, o cara' being another. Hallenberg makes a fine job of the rather prim hero, and her da capo sections in particular are a joy with their elegant and dramatically intelligent ornamentation. What Hallenberg lacks however is the sheer dramatic conviction that Prina brings to the Emperor. Going against the trend of the other singers, Prina absolutely comes to life during the recitative sections, making full use of her extraordinarily full range and vocal power. There is a sense of organic release to her phrasing and diction here that sadly doesn't carry across to the arias. While Prina's coloratura singing has always been characterised by a certain precision of articulation, here she takes it a little too far – on several occasions her effortful articulation within runs actively obtrudes into the vocal line and adds unnecessary sharp edges to the sound. Against the smoothly rounded tones of Hallenberg Prina comes off a poor second. Among the supporting cast, Vito Priante brings a pleasing lyricism to the part of Varus, Aetius' confidant, and Anicio Giustiniani produces some spectacular low resonance in the unusually challenging bass role of Maximus. Marianne Andersen is however a little woolly as Valentinian's sister Honoria, failing to sparkle in the splendid and camply pastoral romp 'Quanto mai felice siete'; she does emerge however as the injured party in an evident tempo disagreement with Curtis in the embellished da capo of 'Peni tu per un' ingrata', where orchestral rigidity staunchly deny her the expressive freedom she appears to want. On paper there is much to like about this recording; it is an efficiently authentic interpretation of an under-exposed opera, and boasts a strong cast of singers. Yet somehow it lacks the sparkle that would really woo listeners to this unfamiliar opera. The whole enterprise is unfailingly stylish and correct but lacks the suppleness and the willingness to cast decorum aside every now and then and really get its hands dirty, which – as every good Roman conspirator knows – is the only way to ensure a truly dramatic outcome.